India is considered to be one of the best places for cannabis, where the plant grows wild in abundance. It has been used for millennia in the subcontinent, and is deeply rooted into our culture and religious practices. The plant has helped in the advancement of civilisations across the world. Many people get confused when it comes to differentiating between hemp and marijuana. The two are family plants of the cannabis with two primary classifications — Indica and Sativa. While marijuana can be considered a member of either the Indica or Sativa hemp is a member of the Sativa family. Hemp was used widely for different purposes including as a medicine and for making textile. Extensive research conducted shows that industrial hemp has the potential to change entire industries for the better. Developed countries today are taking initiatives and implementing regulatory policies for the rapid development of the hemp industry. In India, a land where hemp was an integral part of society and played a part in ceremonies in the past, is now being rediscovered and being put to use to foster new industries. Governments are reframing policies related to industrial hemp under the state legislature and are taking positive steps to promote the cultivation of hemp. The hemp industry has vast potential to help in the growth of various markets. The Uttarakhand Government has taken an initiative to reframe its industrial hemp policy and has recently issued the first-ever hemp cultivation license. This means that hemp can now be used to create medicines, textiles, food items, paper, and building materials. A number of Self Help Groups and farmer groups are supported by the State Government and by private players under a Purchasing Power Parity model which aims to advance the size and scope of the industry. It is estimated that annual revenues from hemp textiles in Uttrakhand will equal Rs 240 crore while a farmer who grows hemp will earn approximately Rs 1 lakh annually from its sale. Hemp cultivation is all the more attractive because hemp can grow on barren land and requires little resources including water to flourish. It has a number of uses and it can be used to manufacture goods of exceptional quality cheaply and more efficiently than they are manufactured today. Consider, for instance, that hemp grown on an acre of land can produce as much paper as can be produced from four acres of trees. Such efficiency in producing paper is the need of the hour because trees on thousands of acres are felled each year to produce paper. Hence, instead of felling millions of trees, hemp can be cultivated and used to produce paper instead. There are several reasons to cultivate hemp. First, take the paper. The paper made from hemp fibre can be recycled up to eight times while paper manufactured from wooded trees can only be recycled three times. Hence, not only can a single acre of hemp produce four times as much paper as an acre of trees, but such paper can also be recycled many more times. Clearly cultivating hemp leads to better utilisation of natural resources and as a result, to more prosperity in society. Three, most farmers in India are not wealthy which is why they will benefit immensely by cultivating hemp as hemp can grow on barren land and requires very little resources to flourish. So hemp can be grown cheaply which makes it ideal for cultivation by Indian farmers. One can grow up to five crops in the year under polyhouse. Under open conditions, we can get three crops in a year. The hemp grows vigorously than corn and requires less water, pesticides, herbicides and fertiliser. Hence, it is often referred to as a sustainable crop. The plant has over 25,000 known uses as well. Today, across Uttarakhand there are ghost villages, such villages are so called because they’ve been abandoned and their earlier inhabitants have moved to parts of the country that provide greater economic opportunity. However, allowing hemp to be cultivated has led many from such villagers to migrate back to their villages solely because cultivating hemp has presented them with a means to earn a livelihood. Not only has such in-migration presented villagers with the means to earn a livelihood, but it has also lowered some burden on larger cities to which the villagers, sensing better opportunity, had migrated. Cultivating hemp will also benefit farmers because they can live in their village and enjoy a far higher standard of living, and a higher savings rate, than they could while living and working in a city. Farmers will prosper by growing hemp because hemp can be used to manufacture goods such as canvas. In fact, hemp fibre is so synonymous with canvas that the word canvas is derived from the word cannabis. Once manufactured, hemp canvas and fibre will have many uses, particularly with the armed forces. A reason for this is that canvas made from hemp is resistant to ultraviolet light, heat, mildew, and repels insects making it the perfect material for canvas used by the armed forces. In effect, the manufacture of canvas from hemp will help give an impetus to the domestic defense industry, something which is high on the government's list of priorities. Farmers who cultivate hemp will play a small part in nurturing this industry. The defense sector is one the largest in India and among the largest industries in the world. When farmers manufacture for this industry, they stand to be a small part of one of the largest industries in the world. The process used to refine hemp fibre to make it ideal to produce fabric does require an investment in advanced technology. Hence research institutions and organisations across the world are investing huge capital in R&D programs to invent refining processes and technologies in order to create the finest hemp fabric for use in industries. Such processes, once they are successful, will benefit farmers who grow hemp. Using hemp, a fine and thin fibre of great durability and of high quality can be created which has multiple uses in the textile industry and as mentioned above even has uses with the military. The true scope of hemp remains to be fully explored despite extensive ongoing research to fully understand its uses. In brief, cannabis considered a harmful drug for decades is now reclaiming some of its lost glory and is even shining brightly in the eyes of many as it did in centuries past. The economic potential of cannabis is clearly vast and many countries, including Canada and China have robust hemp cultivation industries. In Canada well over one lakh acre of land is being used to grow hemp. In addition to providing a source of valuable material, hemp production creates thousands of jobs that sustain thousands of families. The twin benefits of hemp fibre and other hemp extracts are supplemented by job creation and fuller utilisation of natural resources. By growing hemp, an economy grows also. Considering the example of Canada and its successful cultivation of hemp, there is little or no reason to believe that similar or greater success can’t be replicated in India. Like Canada, India also has abundant land that is suitable for growing hemp. Yet the cultivation of hemp in India can have a greater impact economically on the nation than such cultivation has had in Canada. For instance, India is a developing country where the successful emergence of an entirely new industry will permeate much of the economy with greater vigour. Indian culture has an intimate relationship with cannabis and cannabis-based products could easily generate revenue for Indian companies in India and through exports. One of the beneficiaries of greater exporters will be the farmers who cultivate hemp. Because India is a developing country, it will take time for Indian industry to adapt and create white goods that meet global standards, yet Indians have an intimate knowledge of the Earth, nature, soil, and crops and cultivating hemp is a natural outgrowth of such intimacy. Farmers in India have a precious relationship with the soil that is almost absent among farmers from other countries. By cultivating hemp farmers in India will be able to foster this relationship and reap the benefits of a higher personal income while also simultaneously benefiting Indian industry and the whole economy. Shalini Saksena adds: A farmer in Uttarakhand, Ashish Rawat who has 70 acres of land tells you that before he started growing hemp, the main crops he would grow was rice, wheat and mustard for personal consumption. “Some people came to our village and told us about hemp. This is the first time that we are growing the plant. At present, out of 70 acres, I am growing hemp in three acres. The land has been taken on lease from us — we have been paid Rs 300 per nali (one nali is 16 mutthi, one mutthi is 128 sq feet). There are several benefits of growing the plant since one can make so many products from it. But at present, we are using the fibre only. We are hoping that we will be given permission to use it for other products. Take China, today is the largest producer of this fibre. We can be No 1 too if all the departments like the Horticulture supports us. This will help other farmers to grow the plant who are scared to grow it at present even though we have been given permission. It is illegal to grow the plant but because IIHA is the mediator, all the paper work has been done by them. But people are still scared. Some farmers have a wait and watch policy. They want to know how much benefit it will give me and a few other farmers from whom the land has been taken on lease,” Rawat says, an Arts graduate from Delhi. He tells you that while villagers are interested in growing hemp, they do want to stay away from a plant that gives a high. But he is quick to point out that since the State has legalised growth of hemp with THC of less than 0.3%, people are less wary. “More so, since we are given the seeds and the know-how on how to plant and take care of it. Not that it requires a lot of work. It is an easy plant to grow here since the plant grows wild in our country. 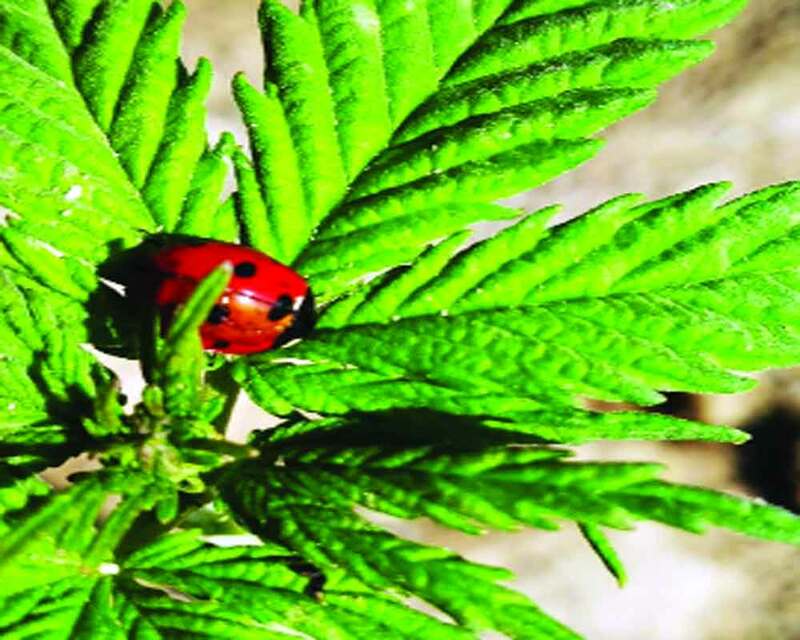 It is another matter that the wild plant has more than 4% THC and comes under narcotics. Dr Chandar Prakash, Director Fibre with IIHA tells you that there were several challenges faced before they could actually start growing the plant in India. “Since the cultivation of the plant was banned in India, the first challenge was to convince the Government that this particular plant was not narcotics and that it had lot of benefits. From the Excise to the Narcotic Department, we held a lot of workshops and seminars before they even convinced. We had to give them lot of literature on the plant. We had to tell them that the seed that we wanted to grow had THC of less than 1.5%. The Narcotics Department have set rules which the Excise Department follows. Since they can’t different between the plant — which one is narcotic, which is not, they blanketed it under one category. Convincing them to do so otherwise was a challenge. The seed that we are using has less than 0.3% THC,” Prakash explains. He tells you that in order to prevent any misuse, there are some checks. First, the place where this plant is growing, the geo location has to be shared with the departments. Second, before the plant is harvested, the local Excise Department will check the THC level, if it is more than the prescribe limit, the entire crop is destroyed. Third, the farmers had to be convinced, that this particular seed is not narcotic. Since the plant looks the same, prima facie the farmer will be behind bars. The stakeholders had to take all the people involved and move forward. “Another challenge was to convince the Narcotic Department to put this plant under Horticulture and not Excise. At present we can only use the seed and the fibre. This is only 20 per cent plant usage. If the entire plant is non-narcotic, why can’t the entire plant be used? We have already given representation to the Government, on paper and even field visits have been organised so that we can use the whole plant,” Prakash says.